Hi, the pipe inlets on this product are fixed so unfortunately there is no adjustment in this. Sorry we couldn't help more today, please let me know if you have any further questions! Hi, as we don't recognise the code you have given I am not sure if it is compatible. If you would like to email info@victorianplumbing with more information we could help more with this matter. Thanks! Hi, the inlets and the outlet are all 15mm on this item. Thanks! Q. Can it be used with surface mounted pipework? Hi, the Traditional Twin Exposed Thermostatic Shower Valve is designed to be used with concealed pipe work. You may want to look at product number AG302 which may suit your needs better. Hope this helps. Hi Kevin, yes this shower valve has an anti scald device built in. Hope this helps! Q. Who manufactures this product? Hi, the Traditional Twin Exposed Shower Value is manufactured by Ultra. Thanks. 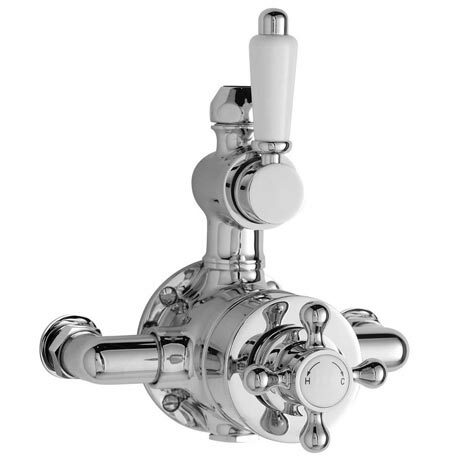 Unfortunately the Traditional Twin Exposed Shower Valve is fixed at 147mm and cannot be altered to suit 155mm centres. Hope this helps! Q. What is the centre distance between the supply inlets to the mixer valve. The distance between the inlet pipe centres is 147mm. Please let us know if you need anything else.